General Hospital (GH) spoilers tease that Margaux (Elizabeth Hendrickson) has a few tricks up her sleeve. She recently had a hunch about the flash drive Drew’s (Billy Miller) looking for. That hunch led her to the Metro Court’s lost and found box. Margaux pocketed the flash drive, but what happens next? She doesn’t seem in any hurry to give it to Drew. If she intended to just hand it over, she probably would’ve tracked him down again immediately. Instead, Margaux may have other plans. She must realize she’s got something quite valuable in her possession. Perhaps Margaux will propose a deal soon. GH fans know that Margaux’s always on a mission for justice. She also seems to hate the Corinthos clan and everyone tied to them. 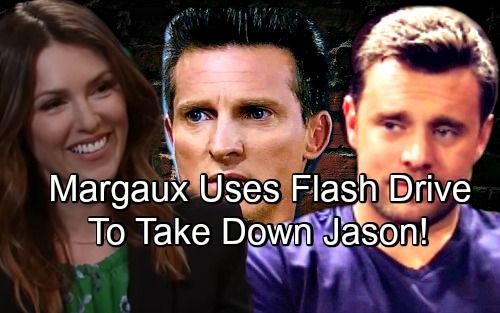 Sonny (Maurice Benard) and Jason (Steve Burton) have gotten away with plenty of crimes, so Margaux’s understandably frustrated. Margaux succeeded in locking up Carly, but she’s got bigger fish to fry. This flash drive might give her an advantage. Drew has been inching toward peace with his brother lately, but Jason still isn’t his favorite person. When pressed, would Drew be willing to sell Jason out? Let’s say Margaux reveals that she has the flash drive. She might stash it somewhere for safekeeping before dropping that bomb on Drew. Margaux could add that she’s more than willing to give it up – for a price. Drew’s memories are saved on this tech gear, but Jason’s memories may be the ones Margaux really wants. She might negotiate in an attempt to nail this hit man. Drew once mentioned that he had the power to put Jason away. He’s in a unique position since he has Jason’s memories, but he didn’t actually commit those crimes. Drew recalls years and years of drama that could incriminate “Stone Cold.” He remembers every gun shot and body that’s been disposed of. Of course, Drew would have to weigh his options carefully. Sam (Kelly Monaco), Jake (Hudson West) and Danny (T.K. Weaver) would all be affected by this. Drew’s initial reaction would be to turn Margaux down, but what about after Jason and Sam’s reunion? Will it reignite some jealousy for Drew? We also can’t rule out the idea of a major setback. If something else comes between Drew and Jason, it could start quite a war. Relationships can shift in the blink of an eye on General Hospital. If Drew still refused, Margaux might have a way to sidestep the problem. With the flash drive, Drew has a chance to get his own memories back. That means Jason’s memories will have to be wiped. It’s reasonable to assume those could be saved as a copy. If Margaux can somehow view Jason’s memories, she might think this would ease Drew’s guilt. There must be some high-tech device to make that happen. Margaux might contend that Drew wouldn’t have to truly be involved. Drew might keep fighting Margaux on this, but she could withhold the flash drive if he doesn’t cooperate. This is his shot at a safer path to remembering who he really is, so Drew may be awfully torn. Plus, things have been just a bit too easy for Drew and Margaux so far. Adding some anger and frustration could certainly rev up the sexual tension. That’s just how it works on soaps! General Hospital spoilers say Margaux will make Drew’s life messy, so don’t miss the ups and downs ahead. We’ll give you updates as other GH news comes in. Stick with the ABC soap and don’t forget to check CDL often for the latest General Hospital spoilers, updates and news.